Good news! Karen is not leaving us after all. We had a good chat earlier and have come to the conclusion that we are all crazy just sitting here in this big old house in the jungle whilst there is so little going on right now. No wonder we're all losing it a bit. So, we are going to take turns in going to the islands and doing other fun things. All we need is one or two people to "hold the ford" & the rest of us can go and have some fun somewhere else. So Andy, Lucas and I will go to San Pedro tomorrow & Karen will change places with us on Wednesday. That's all I wanted to share right now. I'm gonna go and pack our bag. 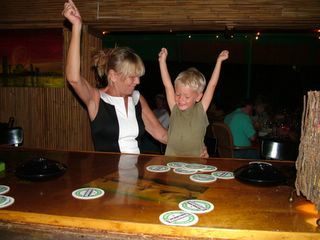 Living at the Belize Jungle Dome is a wonderful experience, but sometimes we all go a bit stir- crazy here. Especially at this time of the year, the slow season. There aren't enough guests around to keep us on our toes and sometimes it feels like the jungle is caving in on you. Everything is just so bloody quiet and predictable this time of year. And our nearest "town", the capital Belmopan is so incredibly sleepy and small (9000 inhabitants) that going there isn't much of a relieve from the boredom. There is no gym, no nice restaurants or cafes, no theatre, no interesting shops, no cinema (you can see 2 movies a month: one at the British High Commission and one at the Cultural Centre) & there is little that resembles a "social scene" in Belmopan. It is a pretty boring place. Safe though, which is a plus, but still quite boring. The highlight of our day is the daily shopping trip. I guess we could buy food for a few days in advance, but then what would we do? At least this way we get out of the house for a little and have a short change of scenery. If Karen were to leave us, we'd have a bit of a problem on our hands too. She is such a great person to have around and such a brilliant worker. She does all our paperwork, answers emails, runs the bar, plans the work schedules, etc. Plus, she helps with the pick-ups and drop-offs from the airport & takes turns in doing the food shopping. If we have to do the coming high-season without her, there would only be Andy & me to do all these things. We would have to run the bar, drive up & down to Belize City to pick people up, do all the food shopping, answer emails, do all the paperwork & look after Lucas at the same time. Plus, I would be heavily pregnant at that point. So, obviously, we hope that Karen will not decide to just leave us like that. I mean, I know things always work out anyway. But still....it would be so much better if Karen just decided to stay here. Plus, I would really miss having her around on a personal level. It's so nice to have some more female energy around this place. It makes living here much easier for me. But then, what if she decides that she wants more excitement? How on earth can we give that to her? At this time of the year, it isn't exciting here. I totally agree with her. I'm going stir-crazy myself, so what can I say to her? Okay, got almost all the schoolbooks for the local kids. Last year it took me weeks to buy the books, but this year it's a lot easier. One main reason is that we don't sponsor as many children this time around. A lot of families have moved from the area, some older children have started working instead of going to school (this is normal in this part of the world) & some families are in a better financial position this year, in which case they pay for the first child and we pay for their other children. Also, I never managed to raise as much money this year as last year and the local people know this, so there are no other children coming out of the woodworks either. Last year was the opposite, someone made a rather large donation and the word spread quickly. Suddenly I got swamped with families & children that I had never seen before. Still have to find the money to pay for the transport for all the kids for the year, but I'm confident that that will come somehow. A bit late....but here are some Aruba pictures. It was great to see my mum and my sister again. Miriam and her husband Laurenz, After all these years together, they are still so in love with eachother. Very cute. It was nice to see how gentle Lucas was with a baby that we met at the restaurant. Let's hope he'll be that nice to his future brother or sister too. My heart is breaking as I read about the latest London disaster on the BBC website. Oh my God, bombs going off, others almost going off, someone getting shot on the Underground....where does it all end? It's weird, even though I would never want to live in London again, I still feel such a close relationship to it. Almost like it's a dear old friend, a person more than a place. But then I did spent all my adult life there (11 years in total) until we moved to Belize. It must be so hard living in London now. I mean, you are so dependent on public transport in a place like that. So what are you going to do? Stop living? Stay indoors all the time? Walk everywhere? I especially feel for my London friends who have children. Because, of course, you worry even more about your children's welfare than your own. And how are you going to protect them? When you don't know where the next threat is coming from? My heart goes out to all of you there. I wish there was something I could do to help. I guess all I can do is send my love. I love you all. Aruba was fun. Just hung out with family, really. 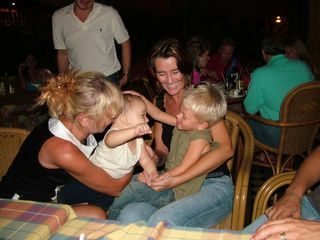 Lucas was getting really spoiled by his nan and aunty & obviously, he was loving it. Oh, and we were being followed around by hurricanes. First, hurricane Dennis came right past us in Miami, then Emilly brushed past Aruba and then that same hurricane followed us towards the Yukatan. We didn't feel much of it in Belize, though. That's all for now. My head is pounding, I'm gonna chill for a bit. Right, we're off to Aruba tomorrow, we're gonna visit my mum and my sister. I haven't seen my mum since last October, so I'm really looking forward to this trip. And I'm so happy that Andy is coming this time. 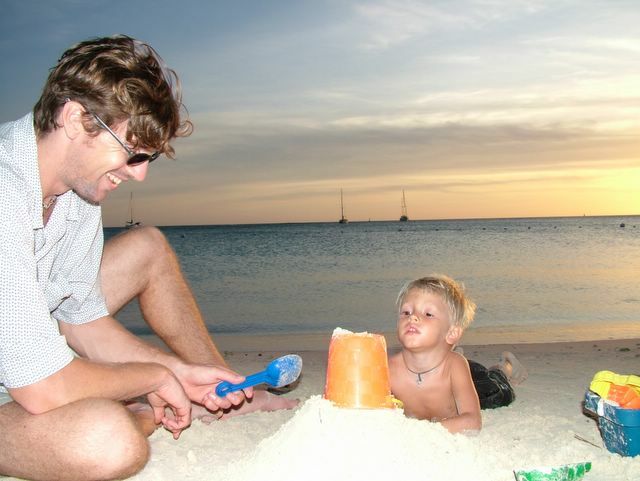 He's never been to Aruba before, it was always just Lucas and me. It's gonna be quite weird being in Aruba whilst that American girl is still missing there. What a bizarre story that is! My mum tells me that the island is swamped with CNN reporters. Anyway, I'll let you know what the mood is on the island, I'll try and blog from there. Our sweet old gardener "Pops" has died. He passed away 3 days ago. He was Tella & Nora's stepdad. Lucas keeps saying: "Pops really, really tired" & "Pops no wake up". He also says that Pops now sleeps on the clouds and waves at the clouds. Obviously, Tella & Nora are very sad. We visited them last night at the wake (first time any of us has seen a corpse). Pop's coffin was out on Tella's porch & everybody was asked to come and have a look at Pops. I found it all rather unpleasant & had to walk away once to have a little cry (was I just being hormonal?) Anyway, I didn't want to offend the local custom, so quickly returned and just played with the children a bit. Apparently, from about 10 o'clock onwards, Tella's house was packed. And people stayed the whole night (Unlike Irish wakes, all without any alcohol). I believe they just held an incredibly long church service, by the sounds of it. Today we went to the funeral, which again is quite unlike funerals back home. Basically, people build their own graves here out of bricks and cement. The whole structure is above ground and the coffin gets sealed inside of it. Whilst the men were bricking up the structure, all the children were climbing on the other graves and jumping from one grave to the other. I asked Tella if they were carving or writing Pops name on the grave. But she didn't think so. Still, I wonder if this might be a better way of doing things. Why spend a fortune on funerals, cremations or grave stones anyway? We better spend that money whilst we are still alive. That's a lot more fun. By the way, my "morning sickness" is more like "morning, afternoon & evening sickness" these days. It's horrible. There are moment when I feel human (like, right now) & the rest of the time I feel awful. I can't remember feeling this bad when I was pregnant with Lucas. The worst thing is that I can no longer drink coffee! Especially my morning coffee I miss. That was always my favorite part of the day; breakfast, coffee & watching the sun come up. It feels so weird to just have breakfast with a glass of water or juice, but coffee makes me feel sick now, even when I just look at it. Again, this is something that never happened to me when I was pregnant with Lucas. Oh well, just another month and a half of this. After the first trimester, I should start feeling much better.